I’ve received a press release from the SL Bar Association SLBA) announcing that Agenda Faromet, who in the physical world is an attorney specialising in privacy and internet law operating out of San Francisco, will be discussing the July 16th, 2014, changes to Section 2.3 of Linden Lab’s Terms of Service and also the recent changes to the Lab’s Skill Gaming policy. Linden Lab has recently announced changes to the Terms of Service associated with Second Life. This change comes almost a year after the major controversy that erupted last year over a substantial change in section 2.3 of the agreement with users of Second Life, related to the license claimed by Linden Lab in works created by creators in-world. Please join us for a lively discussion of the actual language changes from the prior terms of service. Agenda will also discuss other changes implemented by Linden Lab, including the gaming policy. The discussion is set to take place in the SLBA courtroom, starting at 10:00 SLT on August 2nd. I hope to be able to attend the meeting and provide a transcript through this blog. Update, July 28th: As per the comment following this artilce, the competition deadline has been extended through until August 31st, 2014. I recently received an e-mail concerning RezMela, a scenario-building tool intended for training and simulation hosted on Kitely, and which is currently running a competition with prizes totalling $500 USD up for grabs. 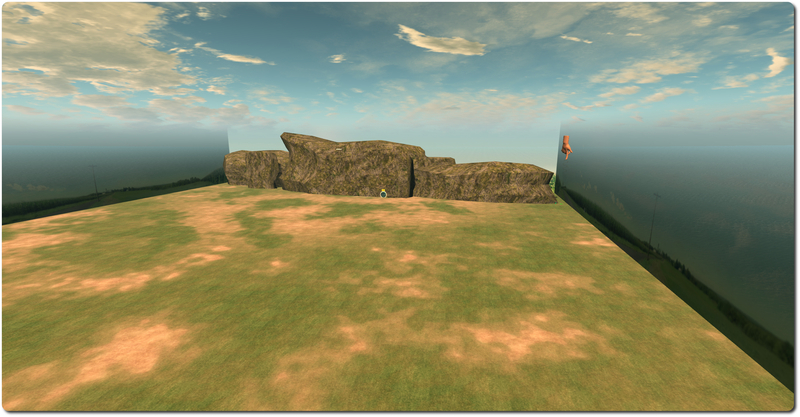 RezMela, currently in an alpha / beta mode, essentially allows subject matter experts to create and deliver interactive training within a virtual environment. It comprises a classroom-style theory space, where students can learn about and watch presentations on the subject being taught, and a practice space which is dedicated to learning-by-doing, through the use of immersive simulations. Simulations – referred to as scenarios in the RezMela documentation – can be rapidly developed and deployed using the Creation and Control (C&C) board. 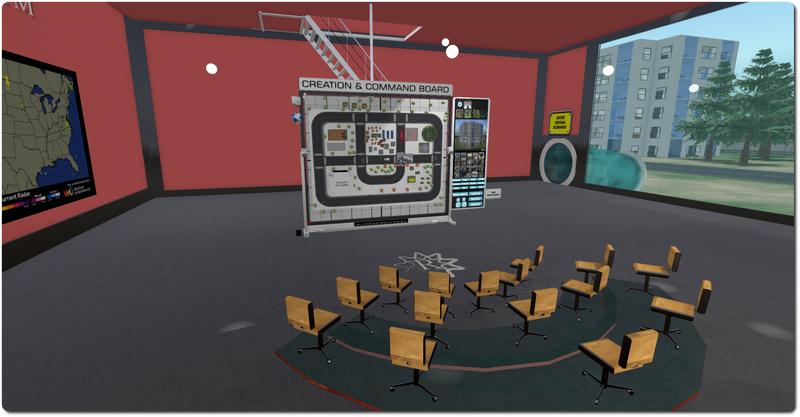 The C&C board provides the subject matter expert with access to a wide range of simulation “primitives” (not to be confused with the basic building blocks of OpenSim and Second Life). These RezMela “primitives” are trees and plants, buildings and structures, vehicles, terrains and so on, and a selection of different types of non-player characters (NPCs), which can be combined to create a required training scenario. The C&C board presents simple 2D map on which icons representing the various “primitives” can be positioned, rotated, etc. As this happens, the actual simulation objects are placed out in the practice area of the RezMela environment, thus allowing a simulation to be quickly put together. 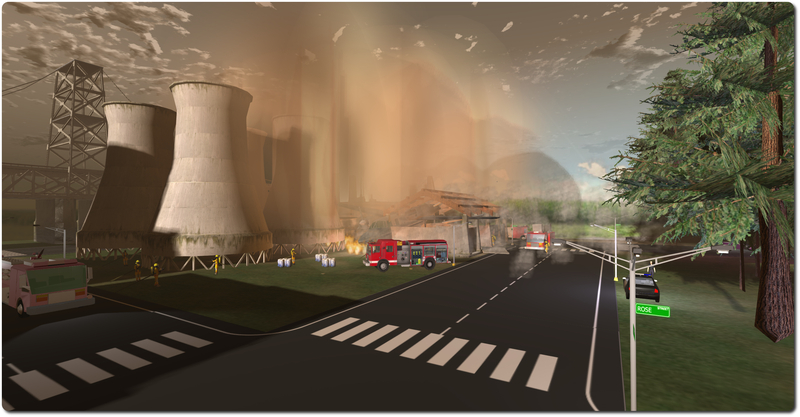 Once the scenario has been built, additional elements such a weather, fires, smoke, dust, etc., can be added, and the time of day for the scenario set. When everything is ready, the scenario can be saved to the RezMela system, allowing it to be instantly recalled and created within the practice space at the click of a button. NPCs and Objects within a scenario are not necessarily static or empty shells. 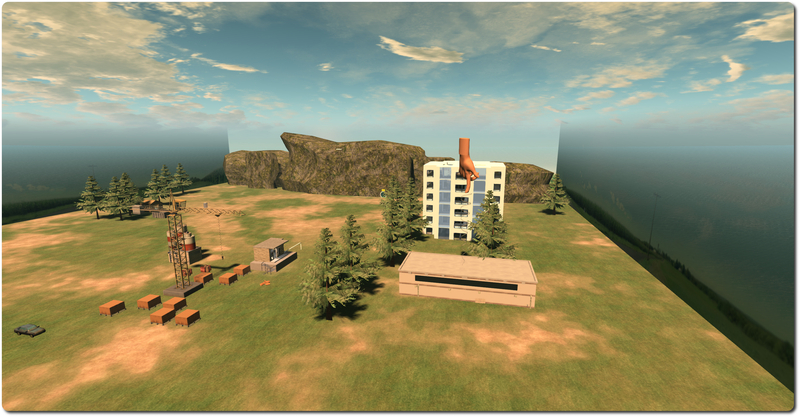 Building and structures can have interiors, lending themselves to many different uses, and student can interact with various objects and vehicles, while NPCs will respond to stimuli around them. As well as enabling easy creation of scenarios, the C&C board can also be used to deliver classroom videos and presentations on the subject matter. Combining the theory and practice spaces allows subject matter experts to provide information and guidance on a specific learning / training environment within the theory space via the C&C board, and then monitor students’ performance in real-time as they tackle the challenges presented in the scenario in the practice area. Scenarios can be entirely created from scratch to suit a specific training / teaching requirement, or can be based on physical world situations, such as emergency or disaster management situations which have occurred, allowing students gain additional insight into such situations and events. The system can also be used for educational purposes as well, such as for teaching health and welfare or in teaching environmental matters and so on. To help explain how the system works, DeepSemphore LLC, the company behind RezMela, have provided a range of videos and a slideshow introducing the basics of the beta system. There is also an in-world campus and workshop regions available to RezMela users where further information can be obtained.